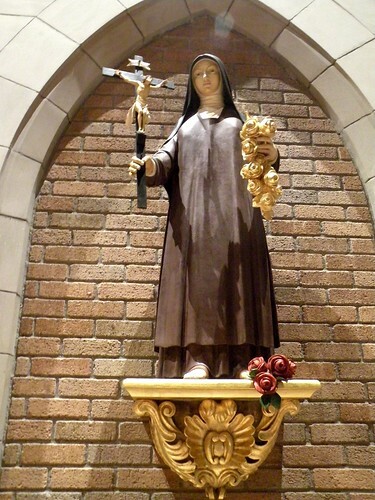 St. Therese of Lisieux – dscn0441, a photo by CadyLy on Flickr. This has been on a sticky note in my office for years now, “I, then, a prisoner for the Lord, urge you to live in a manner worthy of the call you have received,” (Ephesians 4:1). I always pair this in my mind with James 5:16, “Therefore, confess your sins to one another and pray for one another, that you may be healed. The fervent prayer of a righteous person is very powerful. Since I have been given this vocation to pray for my priest, I find it necessary to be extra-aware of the sins that I commit and to go to Reconciliation often. I mean, believe me, I am concerned about my own salvation, but more importantly, I have been gifted with this person to help support in prayer and I want to support him in the best possible way. No one wants to meagerly provide for her children; she wants to provide them with all the good things in the world! So, if being a holier person, if having a closer relationship with God, means that my prayers could be more powerful, more efficacious, than I will seek towards that. Not that I think that my prayer is what is efficacious in this. It’s not like prayer is like putting a quarter in the vending machine, and when enough quarters have been inserted you get the snack or the prize. Not at all. It is entirely God’s doing. His free gift. Yet, He allows for our participation. And it is this aspect which I wish to maximize. So, it is for the sake of my priest that I try to live in a manner worthy of the call which I have received, so that my prayers may be powerful before Jesus on his behalf. Previous Happy Birthday to My Car! Next As Catholics, Can We Pray for God’s Forgiveness for the Sins of Others?